Clothing with ruffles can make a big fashion statement and it’s never been easier to do so. In addition to the ruffle trims you might see on spools at fabric shops, today you can find stretchy ruffled fabrics by the yard in solid and print knits. No stressing over gathering the ruffles and finishing the edges, just buy it by the yard. 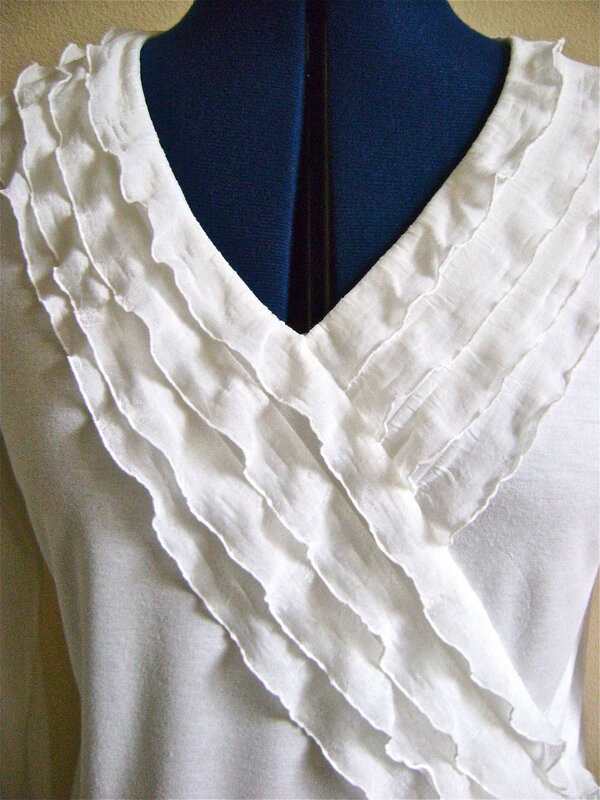 You can find ruffled knit fabric online at Fabric.com. I wish I had bought more. There are so many ways I can think to use it. The directions for my top can be adapted to most “V” neck tee shirt patterns. I adorned mine in an unexpected way with four rows of ruffles aligned diagonally. I also added two horizontal rows at the sleeve cuffs. So feminine, yet easy to do. Fraying isn’t an issue with this knit fabric making detailed edge finishing unnecessary. step 1 - Fold the shirt front in the center and press in a soft crease extending about 4 inches down from the point of the “V”. Snip a ½” opening in the point of the “V”. step 2 - Four rows of our ruffles measure 4” wide. One inch margins of flat sheer knit separate each ruffle making it easy to cut away rows and still have an allowance to work with. Decide how many rows of ruffles you want to use and cut a length long enough to reach from your right shoulder and end at the left hemline. Cut another length for the left side that reaches from the shoulder and ends about 3” past the shirt’s center crease. step 3 - Pin the left side ruffle strip ½” from the neck edge, working from the shoulder to 2” or more past the center crease. The strip should be long enough so that the raw edge will be overlapped by the right side strip when it is attached later. step 4 - Cut the end of the strip at an angle so that it overlaps the center crease by about 2”. step 5 - Cut a piece of stay tape the same length as the left “V”. Pin it on the wrong side of the fabric. step 6 - Stitching ½” from the raw edge, sew through the ruffle margin, shirt fabric, and stay tape, beginning at the shoulder and ending at the slit in the “V”. Finish the 3 joined edges with a zigzag or overlock stitch. step 7 - At the end of the stitching, cut a little less than a ½” slit (see red line) in the flat margin which will allow the fabric to be turned under. With right sides together, sew the remainder of the ruffle strip to the shirt starting at the slit and ending at the raw edge. step 8 - Use painters tape to secure the loose ruffle edges to the shirt. step 9 - Pin the right side ruffle strip to right side of shirt front. Follow steps 5 & 6. At the end of the stitching, cut a little less than a ½” slit in the flat margin which will allow it to be turned under. step 10 - With the right side of ruffles to the right side of the shirt, sew the remainder of the left ruffle strip to the shirt, from the slit, over the left ruffles and all the way to the hemline. Remove the tape on the left ruffle strip and trim excess. step 11 - Cut a 1 ¼” strip of jersey for a back neck band. It should be the same length as your back neck shirt edge. Fold the jersey in half and sew it to the neck edge with a normal 5/8” seam allowance. Stretch the band slightly as you sew. The resulting band will be ½” wide. Finish the seam with a zigzag or overlock. step 12 - Sew shoulder seams together with neckband and front neck seam allowances open and laying flat. step 13 - Turn neckband and front neck edges to the underside and pin in place. step 14 - Sew the front neck edges down by sewing underneath the first row of ruffles. The stitching will be hidden when the ruffle is in place. Top stitch the back neckband. step 15 - Complete the shirt according to your pattern instructions. Optional: Sew one or two rows of ruffles to the sleeve edge.